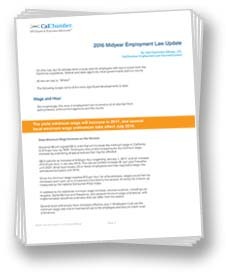 CalChamber’s new white paper explains important changes to employment law. It’s already been a busy 2016 for employers, with lots of action from the California Legislature, federal and state agencies, local governments and our courts. You’ll learn about changes to the state minimum wage and the new federal overtime rule; issues related to transgender employees; protections for non-disabled employees; wellness programs; and “suitable seating,” among other topics. Look to CalChamber’s employment law experts, and our convenient HR compliance products and services, for current and comprehensive employment law information. CalChamber members can download the white paper from the HR Library; nonmembers can download it here.